The E1027 Table was designed in 1929 and is still manufactured today. It looks as ‘modern’ today as it did when it was originally designed. It is another Eileen Gray piece of furniture that has become a design icon/classic. 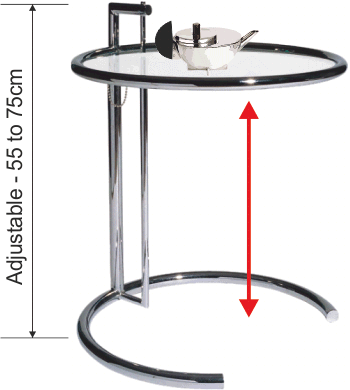 The height of the table can be adjusted. The stand is composed of two ‘telescopic tubes’. These slide to the required height and a pin on a chain is used to lock them in position. High grade tubular stainless steel and tempered glass, provide a quality finish. 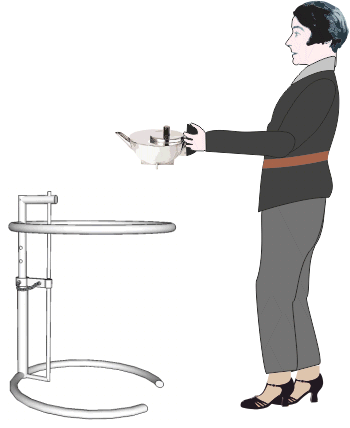 Although originally designed with her sisters love for of eating in bed, it is equally suitable in a lounge, hallway, sitting room and office.